Tom Caldwell, left and George Swinebroad, long time auctioneers at Keeneland. Photo by John C. Wyatt. After nearly four decades presiding over Thoroughbred sales, many as Keeneland's director of auctions, the bold type largely addressed the void his absence would leave on the sale company and the industry at large. The headline could have served just as easily as an epitaph for how he changed the Thoroughbred auction business from the first time he picked up a gavel to the last. Swinebroad's gravelly cadence and sometimes-antagonistic marketing style would feel out of place in the modern auction market, but the results spoke for themselves. Nearly $1 billion in horseflesh changed hands at the fall of his hammer. A native of Lancaster, Ky., Swinebroad began his career on the auction stand as a sophomore at Centre College in nearby Danville, selling real estate and furniture. He took voice lessons next to students learning to sing, but he instead used the teachings to learn proper breathing technique for his chant. Prior to selling horses, Swinebroad sold tobacco, cattle, purebred dogs, and fighting chickens. He took the stand for his first Thoroughbred auction in 1939. He had formal training, but Swinebroad kept the sensibilities from his days as a country auctioneer as he climbed the ladder. A local auctioneer gets to know his bidders over time, and what methods work on them, because the faces don't tend to change. In his eyes, the Keeneland sale pavilion was no different. “Some people like the spotlight very much and you find that out pretty quickly and you don't mind drawing attention to that particular buyer,” Swinebroad told the Daily Racing Form's Logan Bailey in a 1974 interview. “Some of them do not like the spotlight at all, and of course you learn that, and whenever one of those people makes a bid and they do not want the public to know they are bidding, nobody knows that. That's between the bidder and myself. That way, I try to keep on the good side of all of them. 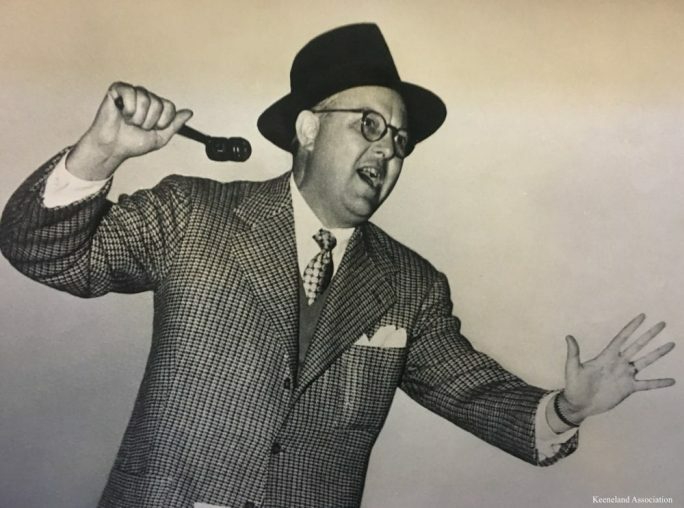 This strategy was wildly successful, establishing Swinebroad as the Thoroughbred industry's preeminent auctioneer, but it was not immune to backfiring when he pushed the kidding too far or was accused of selling a horse too quickly. 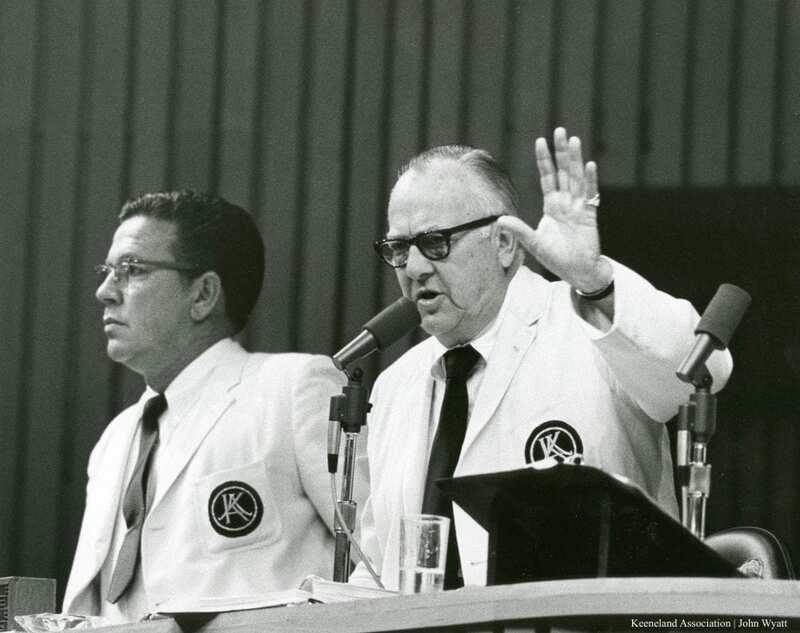 This fact might have consciously or unconsciously affected his hires – including his eventual successor as Keeneland's lead auctioneer, Tom Caldwell. Swinebroad was aware of the dollars he had ushered through the ring, both in gross figures and high-priced offerings, topping out with $625,000 for a Raise a Native colt out of Gold Digger, also the dam of the great Mr. Prospector. As he entered the 1975 yearling season, Swinebroad was zeroed in on two mileposts: $1 billion in total sales and the first seven-figure yearling sold at auction. With the first yearlings by Triple Crown winner Secretariat coming to the ring in 1976, both numbers were well within grasp. He'd fall short of both, dying on May 10, 1975 after heart surgery at age 73. A year later, Tom Caldwell dropped the hammer on Canadian Bound, a $1.5-million son of Secretariat at the Keeneland July sale. Cris Caldwell worked the sale and recalled the weight of the moment vividly. This entry was posted in NL List, Ray's Paddock and tagged auctioneers, george swinebroad, horse racing history, Keeneland, Thoroughbred Auctions, tom cadlwell by Joe Nevills. Bookmark the permalink.